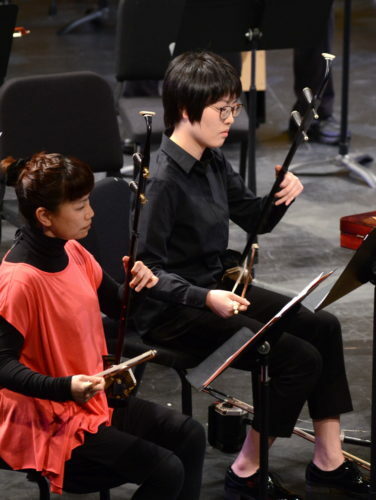 The erhu looks like a ladle with a long handle fitted with two strings and a horsehair bow inserted between them. Its range spans about three octaves. It has some of the qualities of the violin but has more nasal tone. In the modern set-up, erhus are divided into the 1st and 2nd parts. 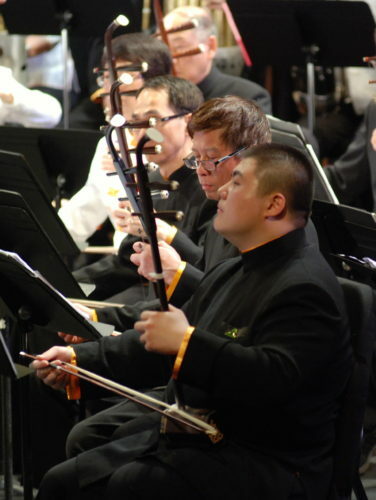 The erhu is an introduced instrument. Introduced during the Tang Dynasty, the erhu is commonly known as the Chinese violin. Ther erhu is played vertically on the musicians lap. The left hand moves along the strings and the right hand manipulates the bow to produce a multitude of sounds and voices. The erhu has a vertical stick like neck. The top of the neck contains two tuning pegs, one for each of the strings. At the bottom of the neck is a sound box. The resonator box has one end covered with snake skin. The erhu and other Chinese bowed instruments are called huqin. The name huqin appears during the Song Dynasty. Quite often, several erhu fiddlers are assigned to play the gaohu which sounds higher than the erhu. This is the descant huqin. The alto species is the zhonghu.